Don't smoke or abuse drugs. Do not drink a lot of alcohol. Avoid alcohol completely if you have a history of excess alcohol use. Take care of your dental health and teeth. Follow good female safety practices. If you are just starting an exercise program and have any pre-existing conditions, such as obesity, hypertension, or diabetes, ask your doctor about an exercise stress test. This test will help you establish safe limits for your exercise program. Begin exercising gradually, perhaps with brisk walking. Don't expect to "get into shape" overnight. Your fitness should start to improve within 3 months, provided you maintain a consistent regimen. You should work hard enough to sweat during each exercise period, but not so hard that you cannot carry on a conversation. Plan an exercise routine that lasts 20-30 minutes, and perform the workout at least 3-5 days a week. Include stretching before and after your exercise. This will help avoid injury. Remember to start slowly and listen to your body. If it hurts badly, then you are probably overdoing it. Aerobic exercises strengthen the heart and lungs and should be part of the fitness routine. Examples of good aerobic exercises include walking, running, jogging, swimming, cross-country skiing, rowing, rope skipping, dancing, racket sports, and cycling. For the biggest benefit, aerobic exercise must be sustained for at least a 10- to 12-minute period. Strength and flexibility exercises are important and help you maintain your ability to do daily activities and maintain balance as you grow older. Adjustments in exercise programs need to be made for children, pregnant women, the elderly, patients who are obese or disabled, and severe heart disease survivors. Exercise plans should also be modified for high altitudes and extreme hot or cold conditions. Cigarette smoking is the single most preventable cause of premature death in the United States, and more than 400,000 Americans die each year from cigarette smoking. One out of every five deaths annually is either directly or indirectly caused by smoking. Secondhand cigarette smoke exposure causes approximately 3,000 lung cancer deaths in adult nonsmokers in the United States each year. Studies have also linked secondhand smoke with heart disease. Stroke (smokers risk is 3 times greater vs non-smoker risk). What causes strokes? It's never too late to quit smoking. A short 2-years after stopping, your risk of heart attack returns to average and there your lung cancer risk drops by about one-third. After 10-years of not smoking, your risk for lung cancer returns to near normal. Consumption of alcohol gradually depresses brain function. Emotions, thought processes, and judgment are first to be affected by alcohol consumption. With continued drinking, motor control becomes impaired, causing slurred speech, slower reactions, and poor balance. Both increased body fat and drinking on an empty stomach speed the rate of alcohol intoxication. Do not drink alcohol when you are pregnant. Fetal alcohol syndrome is the most common known cause of mental retardation. Parents should talk to their children about the dangerous effects of alcohol. Establish trusting communication with your children so that sensitive issues can be discussed. Don't allow your children to be guided completely by their peers. Children need firm and loving guidance. Everybody reacts differently to medications. 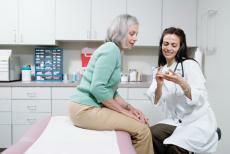 Always tell your doctor about the meds you are taking, including over-the-counter medications and vitamins. Drug interactions can have serious health consequences. Elderly people should be particularly careful about drug interactions with multiple medications, and should closely monitor this situation if it applies. Carry a list of your current medications, especially when going to different doctors for the treatment of different problems. Avoid drinking alcohol while on medications -- this combination can be very dangerous, particularly with tranquilizers or painkillers. Mothers-to-be should avoid taking any unprescribed drug during pregnancy -- especially during the first trimester, when the fetus is very sensitive to drugs in the mother's body. If you have been taking any drugs just before becoming pregnant, inform your doctor. Always take medication as prescribed. Taking any drug in a manner other than as intended or in quantities other than directed is considered drug abuse. Abuse and addiction are not just associated with illegal "street" drugs. Legal drugs such as laxatives, painkillers, nasal sprays, diet pills, and cough medicines can also be misused, resulting in serious female health problems. Addiction is defined as compulsive use of a substance despite continued negative consequences. Simply needing a drug (like a painkiller or antidepressant) and taking it as prescribed is not addiction. Signs of drug abuse in teenagers may include: apathy, temper tantrums, missing school, sloppy dress, lack of interest in school, excessive demands for privacy, secrecy, and a change in type of friends. However, some teens in trouble may show none of these symptoms. Stress is normal. It can be a great motivator, and in small amounts can even improve health. However, excessive stress can cause headaches, sleeping problems, stomach problems, mood problems, and more. Learn to recognize the things most likely to cause stress in your life. You may not be able to avoid all of them, but knowing the source of your stress can help you feel more "in control." The more control you feel you have over your life, the less damaging your stress.